Build valuable relationships with Real Estate Professionals by offering them turnkey, marketing solutions to help them grow their business! According to the latest statistics from NAR, 46% of real estate firms state that keeping up with technology is one of the biggest challenges they face over the next two years. We constantly work to improve our product and services, adding new features all the time. Let us keep you at the forefront of real estate technology, and position you as the real estate technology expert that you are! In a nutshell, we provide you with a proven system to help agents market and sell their listings. All of the marketing collateral is co-branded with your information. When agents login to our toolbox, they receive a welcome message from you, constantly reminding them that you're the one who is providing them with all of their amazing marketing tools! You can invite agents to join by adding a link from your website, or sending them personalized email invitations. Once an agent signs up, they are automatically placed into your account. With our Co-Marketing service you can provide agents with a complete Real Estate Marketing solution. 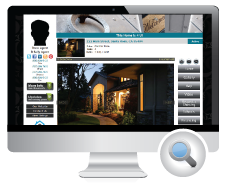 Our listing marketing tools include single property websites, smart lead capture, property videos, social media promotion, craigslist flyers, our property feedback system and much more! Every property website is Co-Branded and Co-Marketed by you, so you can now reach Buyers directly and get more leads. Not only will your ads appear on all of the property marketing material, but we also include a welcome message that the agent sees each time they login! You have complete control over where your ads appear and if you get CCed on any website buyer leads!